Go ahead and carve out a spot in the NASCAR Hall of Fame right now for Jimmie Johnson. I know he isn’t eligible yet, but if he weren’t already ensured a spot after four consecutive championships, adding a fifth on Sunday should make him a no-brainer. He's now won five titles, four by amassing big points leads in the preceding nine races and now a fifth by coming from behind. If drivers had to write an essay to win the championship, he'd likely get bonus points for penmanship he is so smooth. For all of those fans who think Johnson winning five in a row is bad for racing, that's easy to say but not as easy in practice. Someone still has to beat Johnson to become champion. And in the face of likely his toughest competition to date, he still came out on top. It’s easy to say someone else should win. What's not east is apparently getting someone else to do it. You don't want to see Johnson or his team celebrating No. 6 next season? Then you better hope another finds a way to beat them. 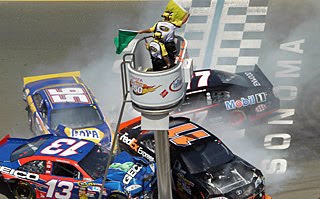 Unless NASCAR puts a cap on Cup championships for individual drivers - which some fans may actually think a good idea - I suspect Johnson and his team will be in title hunts for many years to come.